Much of the Galena City Council meeting last night was spent discussing recent developments with the biomass energy project in Galena. Sustainable Energy for Galena Alaska, or SEGA, is the group that is set to harvest local trees for a wood-fired heating system on the base. There had been delays in securing a timber sale agreement with the landowner, village corporation Gana-A’Yoo Limited, and in getting contract engineers to finish the design plan for the wood boiler and the system to distribute its heat around the base. But the City Council on Thursday heard about advances on both of those issues. The Council had already agreed to sidestep legal hurdles with the timber sale agreement by entering the City of Galena into agreement with Gana-A’Yoo directly. SEGA General Manager Tim Kalke reported that the new terms of the agreement were acceptable to everyone, giving the project the green light to begin cutting trees. 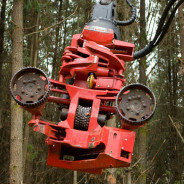 SEGA recently took legal ownership of the timber harvest equipment that it will use to cut down trees and turn them into wood chips. The City of Galena originally purchased the equipment with a state grant. Now SEGA is looking for a warm place to maintain and store the rigs. Kalke explained that the old state shop on base looks like a perfect candidate, but the likely presence of asbestos might complicate the transfer of the building from the state to local ownership. The City Council also chose to switch engineering firms to Anchorage-based Coffman Engineering. Several council members have been critical of the current firm, Gray Stassel Engineering, for failing to deliver designs and documents on schedule. Coffman Engineering estimates a total design cost of around 340 thousand dollars for the biomass project, including the design of the wood boiler, the heat distribution system, and a plan for keeping water and sewer lines from freezing. The current system relies on waste heat from steam pipes to keep adjacent water and sewer lines from freezing, but the heat distribution network on the base is likely to switch to a hot water-based system, which offers greater efficiency. Coffman Engineering suggests that the new wood-based heat system on base could be up and running by September 1, 2016.